As a boy, I loved to watch actor Anthony Andrews play Lieutenant Brian Ash in the TV series Danger UXB. The show revolved around the daring exploits of a young Royal Engineers officer posted to a Bomb Disposal unit during the London Blitz. In reality, over 50,000 bombs were successfully defused during World War Two for the loss of 580 men and one women killed while serving with Royal Engineers Bomb Disposal. A dirty, nerve-racking and incredibly dangerous job that required a special type of courage. However, a job that was never officially recognised after the war. 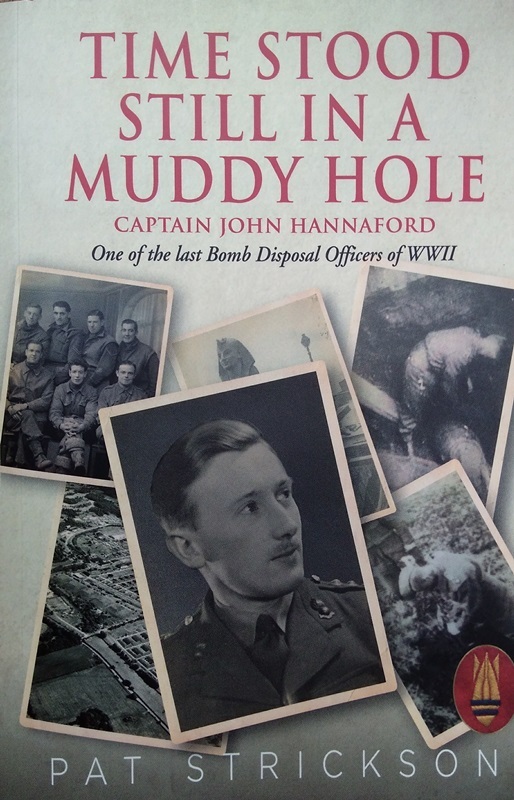 In her book Time Stood Still in a Muddy Hole, first-time author Pat Strickson tells the fascinating true story of Captain John Hannaford, one of the UK’s last Bomb Disposal officers of World War Two. In fact, Pat’s book is really two stories. One is about the life and career of one Avro Frederick John Hannaford. Personally, I think it’s a great name, but John never appreciated it. His father was a World War One pilot and named him after the Avro aircraft company. The second, parallel story is Pat’s own journey to becoming a historical researcher, author and custodian of John’s legacy. It was only towards the end of his life that John started to talk about his wartime experiences. Luckily, once he started he couldn’t stop. He was interviewed for a Channel 4 documentary series and by the Imperial War Museum as well as local press. Sadly, he died on Armistice Day 2015, aged 98, without ever meeting his biographer. A year later, Pat came across a watercolour of a Bexhill landmark in a local charity shop. Her desire to learn more about the artist would lead to years of painstaking research and countless hours in front of the computer. I think the end result was worth the effort. John’s early career as an apprentice architect working at the Royal Ordnance Factory Chorley made him an ideal candidate for officer training with Bomb Disposal. Once qualified, John’s life expectancy was just ten weeks. The physical rigors of the job and constant threat of being vaporised created a unique camaraderie between John and his men. Nevertheless, after two years the stress of the job gave him a duodenal ulcer, which probably saved his life. The men of John’s section were not so fortunate. When tragedy struck, it wasn’t due to enemy action. However misplaced the sense of guilt, John never quite forgave himself for not being there. After the war, he would marry; raise a family and go on to have a successful career as an architect. But the war cast a long shadow. John was a much loved and respected member of his community. That knowledge must have placed the weight of expectation squarely on Pat Strickson’s shoulders. So telling his story faithfully required tact, sensitivity and honesty from the author. Pat’s use of the literary technique known as a frame story works well, essentially telling John’s story by telling her own. Overall, the book is well researched, engaging and informative. I also found it shocking and laugh-out-loud funny at turns. I always think it’s hard to criticise the quality of a biography, after all, who really knows anyone? But the book feels authentic. However, I did find one factual inaccuracy. John’s wife Joyce had been married and widowed. Her first husband was killed during the fighting at Arnhem in 1944. Arnhem is in Holland, not Belgium. Like so many wartime veterans, John remained haunted by his experiences, and yearned to see his comrades properly recognised for their courage, devotion to duty and sacrifice. Pat Strickson’s book certainly goes some way to balancing the scales.